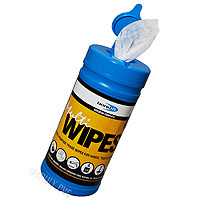 Strong, effective wipes with no irritation! 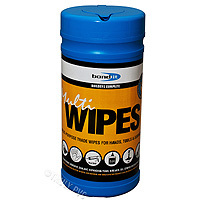 Disposable multi-purpose trade wipes for hands, tools and surfaces. Cleans paint, adhesive, sealant, expanding foam, bitumen, oil, grease, grime and much more. Resealable container holds 80 wipes, so great for on the move when cleaning can be difficult, as well as around the home, office or workshop. They're Anti-Bacterial too, so effective against E-Coli, Salmonella, MRSA and Listeria, while containing Vitamin E and Aloe Vera to minimise irritation to skin. Tested by "The Institute For Skin Research" - no reaction (irritation) was recorded on the test subjects!